It’s three little words I hate. Actually, let me clarify that, I don’t hate them — I despise them. And, sometimes, it’s not even the words, but instead a picture of a dog with a circle around it and a line through it. Boy, do I really hate seeing that. But, in some cases, I also understand it. At the rest area on the highway where all there is inside is rack cards advertising hotels, attractions and tours — who cares if a dogs is there. At the rest area on the highway were there is food services — completely get it. Many people are allergic to them, or have a fear of the four legged balls of fur and I also get that some pet owners are not as considerate as others. In fact, until I started getting allergy shots, I too was allergic to dogs, cats, horses, pretty much everything. Yes, I can pick up Toby and just carry him in my arms while I browse the rack cards to find a hotel, but that’s not the case with a 75 pound dog who also decides it should bark at everyone. As much as I would love for Toby to be welcomed everywhere, especially when I’m traveling, I also completely understand that in some places, it’s just not possible — especially when it comes to indoor locations. I do take Toby to the places I can, but being a courteous dog owner, I also respect that he’s not allowed in places like food stores, shopping malls, rest areas, inside restaurants, etc. So, I make other arrangements that usually means leaving Toby at home. Leaving his sad face while I run to Lowes to pick up gardening supplies breaks my heart, but I do it. It’s also the reason I came very close to calling a store manager the other day when I saw a girl carrying her puppy while her mother shopped in a local supermarket and why I got so annoyed when I saw a woman walking her very large black lab down the aisle of a local hardware store last week. My first thought/words out of my mouth were, “you’ve got to be kidding, My dog is stuck at home, while this one gets to go out and have a good time.” It may sounds silly, but the reason why I was upset was because I know how much Toby loves going places, and I felt he was being punished because his “mom” was following the rules. I know this may annoy some people, but it takes a lot of nerve to know your dog isn’t allowed somewhere, but just take them anyway. It also reflects badly on *all* pet owners. I can’t express how upset I was when I saw that dog in the supermarket. I don’t get to spend every waking moment with my dog or even spend as much time as I would like to with him, so when I see other people bringing their dog someplace I deliberately didn’t take mine, because it was against the rules, it kills me, and makes me sad for Toby. Previous Post Congrats to the Sedalia Animal Shelter on Their Pedigree #everydogdeserves Win! I so agree! Some people I guess, just think they are better and don't have to follow the rules! So frustrating for those of us who do! Agreed. When people disrespect the rules set forth by businesses it does a disservice to all dog owners. 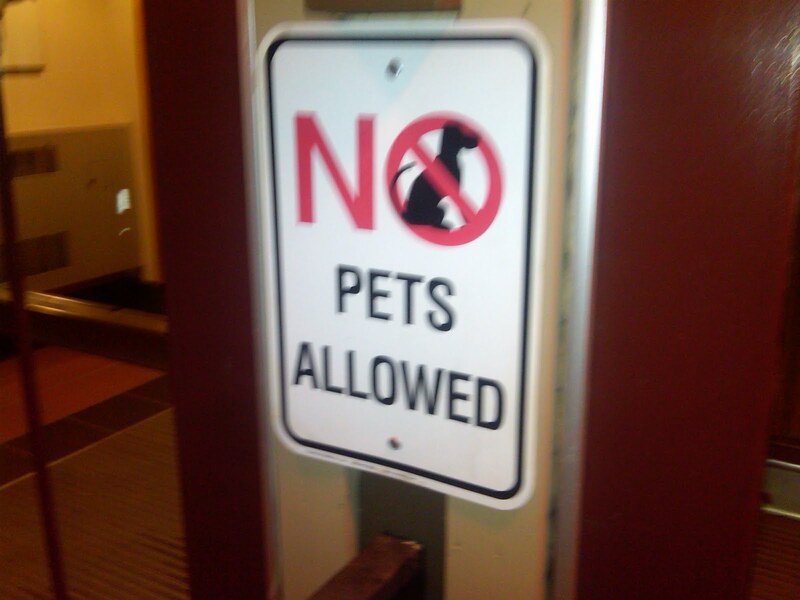 kind of like when i brought a puppy home to an apartment that had a "no pets" clause in the lease. LOL. FYI my new lease says "no pets (except for Yogi)"
The reason there are "no dog" rules are because some dog parents don't make their dogs do right. We used to be able to take our dogs to the local outdoor antique show, but because some people brought their untrained dogs and caused fights, no more. Sadly, it's always the humans fault! We run into this all the time as we travel and it makes me crazy! Dogs off-leash on trails that are clearly marked as being on-leash only, people taking pets in areas of national parks that are clearly marked as prohibited. There are places where our dogs are welcome to join us – it's not like we have no options. (Of couse more options would be nice, but that's a whole other discussion.) My opinion is that if you can't follow the rules, don't go to the place. Find a place where the rules mesh with what you want to do. Breaking the rules is unacceptable.